Before the age of the remote, KNOBS were all the rage in the technological world. The first radios, car stereos, and televisions were all equipped with knobs to change the channels and volume. Nowadays, universal remotes and sensors that read our body movements have made the knob obsolete. For all you old fashion technology fans, GOgroove has combined the latest technology with a retro wooden housing speaker equipped with; you guessed it, a knob! 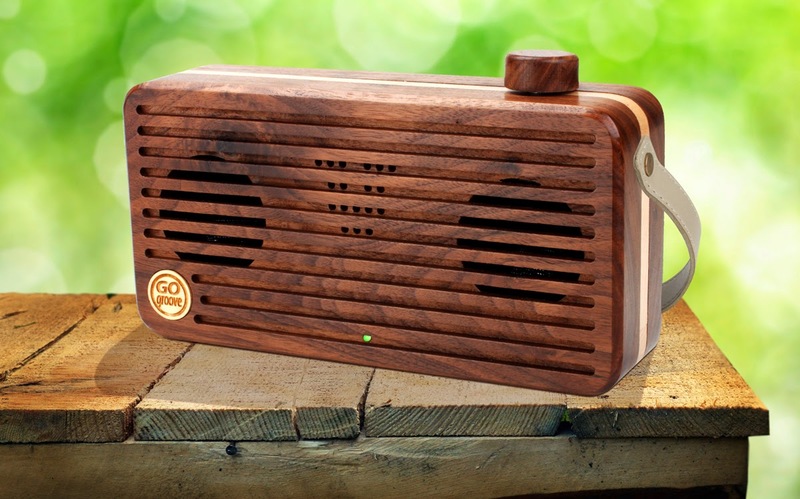 The GOgroove BlueSYNC WUD Universal Retro Wood Bluetooth Speaker is outfitted with the latest wireless NFC technology, an integrated microphone, and portable carrying handle. Starting on March 31st and running through April 7th, Accessory Genie is offering a $10 savings and free shipping on all orders when you use the coupon code ‘WUDSAVE’ at checkout. Don’t miss your chance for great savings. The BlueSYNC WUD is a universally compatible wireless Bluetooth speaker made with real walnut wood that brings a touch of nature into any home. Equipped with dual drivers and a wood housing, the speaker emits quality full-range stereo and captures the sounds that metal and plastic materials usually drown out. The inspired design of the WUD features a vintage wood shell and classic tube style knob for power and volume control. Turn the knob clockwise to power on and adjust the volume. Push down on the knob to play/pause music or answer/hang up a call with the integrated microphone. The BlueSYNC WUD is ultra portable and travel ready as it comes equipped with an attached carrying handle. Don’t be fooled by the vintage looks. The BlueSYNC WUD has been optimized with some of the latest Bluetooth technology. Enjoy great sound without the limitations of wires as this speaker streams audio up to 33 feet away. For increased functionality, the speaker is equipped with NFC technology allowing ‘tap-to-pair’ connection with supported devices. In addition, easily connect all non-Bluetooth devices with the included 3.5mm AUX cable to the AUX port located on the rear of the speaker. The BlueSYNC WUD even charges in 2 hours simply by plugging the micro-USB cable to any computer USB port or AC adaptor. Remember to use the coupon code ‘WUDSAVE’ at checkout to save $10 and get free shipping on all orders placed between March 31st and April 7th. Like all GOgroove products, the BlueSYNC WUD is backed by a 3-Year Manufacturer’s Warranty.